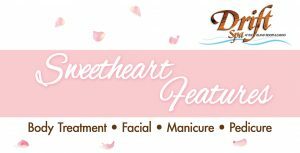 Make your Valentine’s Day special at the Island! The air is cold as snow continues to fall in the Upper Peninsula but Cupid is helping us warm up this season. The Island is the perfect destination for a Valentine’s getaway with plenty going on and much to celebrate! Treat your sweetie to dinner in an evening out at the Island. 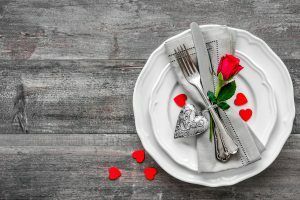 Firekeeper’s Restaurant and 5 Bridges Steak & Seafood House will be open on Thursday, Feb 14 featuring a special Valentine’s Day Menu! Classic dinner options will be available as well as specialty Valentine appetizers, entrees and desserts. The Drift Spa is helping you fall in love with relaxing and indulging treatments available starting January 19. This feature’s focus on Champagne and Rose Butter leaves your skin looking smooth and feeling silky. Plus: Book an appointment for Valentine’s Day, Thursday February 14 and you’ll receive a glass of champagne, chocolates and a single stem rose. Indulge in your sweet-tooth on Valentine’s Day when you use your Island Club card for  random drawings for 18 oz. 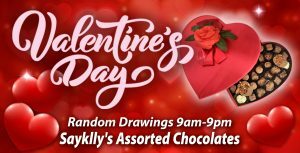 Hearts of Sayklly’s Assorted Chocolates from 9am – 9pm EST. Island Club members, visit any kiosk to receive  entry for every 25 points earned on your Island Club card to win up to $500 cash. You don’t have to be present to win but if you are, dinner is on us! Random drawings held every half hour Wednesday, Thursday and Friday from 6 pm to 10 pm EST beginning February 6.